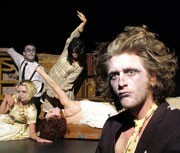 Druthers is an exquisite concoction of visual theatre, digital effects and text, from exciting young company Precarious. A lonesome everyman in a dusty attic searches for some sort of existence. Surrounded by steps leading nowhere, suspended doors and obscenely high chairs, life remains out of reach. An array of characters emerge from the woodwork, weaving him through a surreal landscape of happenings and disturbances until he discovers what he would do, if only he had his druthers.